A known devil better than an unknown angel? I think NOT! As like many other opinions in life, I have taken a long time to form an opinion about the above adage. Ever since the first time I heard it, I disagreed to it. My instinct disapproved of it. However, I remember very clearly a conversation where one of my close friends used this adage, and I disagreed in my head, but I didn't voice it simply because I didn't know how to explain my disagreeable instinct on this one. Today, I write about it, maybe because I am enlightened. Or maybe because my trust in my instincts, which was already very high, has become a constant tool using which I live my life now. And here is my argument. First of all, this is the most nonsensical statement I have ever heard in my entire life. Well, maybe if I had argued about it the very first day I had heard it, I probably wouldn't express it with as much animosity. 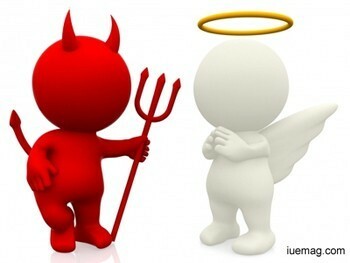 A known devil is better than an unknown angel- HOW? This adage encourages people to be close minded. It is like saying, my job has these given problems, but instead of trying to find a better job, I will try to be ok with the problems that my current job creates for me, because these things CANNOT be fixed, and what cannot be cured, well, has to be endured. It makes you closed to the idea of finding a solution to the various "known" problems of a given job. I am not saying that you should spend half your waking life trying to fix "known" problems instead of just dealing with it- depending on the triviality of it. All I am saying is, if Kekule believed that there was NO solution, he wouldn't have day-dreamed of the Snake seizing its own tail and forming a ring structure, and the world would have never known Benzene. And what a discovery Benzene was!! When we are open to the idea that there is an unknown angel out there waiting to be discovered, life becomes magical, quite literally. SAME to SAME with people. You are in a relationship with a person, he brings out the angel in you, but sadly, you bring out the devil in him. And you say, a known devil is better than an unknown angel. Is it? Don't you want to discover the angelic side that hides in him, just like in all others? We all have an angel and a devil. Why one, we have multiple devils and multiple angels within us. Who summons what is the question, and if you have been summoning a known devil in someone, then it's time to vanquish the devil. A devil won't appear in front of everybody, and if you do have the power to summon him, you should not want the power to live with him, you should want the power to vanquish him, for only what can be summoned can be vanquished. Unearthing angels and slaying demons, a beautiful life it would be, I think.